ENDA not happening this session. Mexico City offers free honeymoon to first gay couple wed under Argentina's new law. 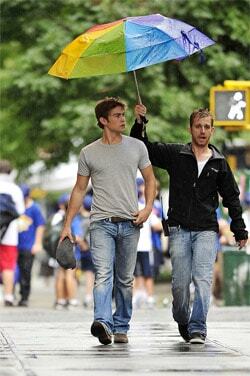 Chace Crawford finds a scruffy PA to hold his Pride umbrella. Bil Browning: Why is GetEQUAL targeting our Democratic allies and ignoring our enemies? Upper layer of Earth's atmosphere collapses in record contraction — scientists don't know why. "Something is going on that we do not understand." An artistic look into the mind of Frances Bean Cobain. NOM's rally in Manchester, NH was underattended. Belgrade activists gather signatures in support of a Gay Pride parade: "GSA Acting President Lazar Pavlović says that his organization contacted numerous public figures who are expected to support the event. He told reporters that GSA’s goal was to have this year’s Pride Parade supported by 10,000 citizens of Belgrade. 'Representatives of most political parties, during meetings with the Gay-Straight Alliance, already gave their support the parade in the capital,' Pavlović said and repeated that Serbian President Boris Tadić had also given his unambiguous support." Vatican compares ordination of women priests to pedophilia. Explanation why charges against Choi and Pietrangelo were dropped: "Hobson wrote that the Criminal Section of the D.C. Attorney General's Office considered the 'Failure to Obey'' charges. ''After carefully examining video and speaking with the officers involved, it was determined that the charge couldn't be maintained,' she wrote." 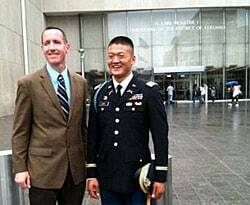 Former Air Force Major Mike Almy to testify in DADT trial today. Nathaniel Frank testified, as did former petty officer 3rd class Joseph Rocha. Melissa Etheridge and Tammy Lynn Michaels' split is getting uglier: "A process server didn't come to Melissa Etheridge's window, but his arrival at the door of her hotel room wasn't particularly welcome, either. 'In a ploy to have me served, and mistakenly believing that by serving me I would have to dismiss my Petition, [Tammy Lynn Michaels] used our children as pawns,' Etheridge states in a declaration released Thursday in which she describes how she was presented with her ex's petition for sole custody of their 3-year-old twins. The Grammy and Oscar winner says Michaels told her the kids were going to meet Etheridge at her hotel. 'Finally, I received a text message…stating, 'My plans changed, sorry,'' the singer recounts." Last month was the hottest June ever recorded: "In June, the combined average for global land and ocean temperatures was 61.1 degrees Fahrenheit (16.2 Celsius) — 1.22 degrees Fahrenheit (0.68 Celsius) more than the 20th century average of 59.9 degrees Fahrenheit (15.5 Celsius)." Kellan Lutz "walks his dog". One of Anna Nicole's doctors charged with fueling her prescription drug habit says he's being targeted because he's gay. Gay man attacked in Washington D.C. hate crime: "Francisco Martin, a makeup artist who describes himself as openly gay, said one of the two attackers struck him in the face and head July 6 with a nine-inch wide sheet of plywood while the other knocked him to the ground and kicked him in the head and body. D.C. police have listed the incident as a bias-related crime and are seeking the public’s assistance in identifying suspects. 'I just tried to cover my face; I just started yelling, ‘stop, stop,’ and they just wouldn’t stop…They just [kept] beating me until they ripped my shirt off. I was on the ground bleeding..
Martin said he managed to walk about three blocks to his home after the attackers stopped beating him and left the scene."